A tide gauge is a device for measuring the change in sea level relative to a datum by continuously recording the height of the water level with respect to a height reference surface close to the geoid, using sensors. Globally, development of efficient and advanced technology, rising demand for accurate and precise nautical charts, flourishing maritime commerce, and increasing exploration of new areas for oil & gas reserves are the prime growth drivers of the tide gauge market. 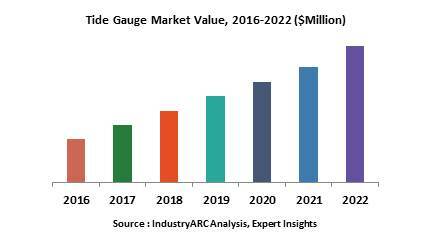 In addition, an increase in adoption of tide gauge for application in new industrial verticals, and emerging economies such as China, India and others, will create new opportunities for the tide gauge market. However, rising risk of counterfeit products, stringent government regulatory legislations, higher cost of research and development, and higher cost of tide gauge are the key restraints for the tide gauge market. Geographically, North America dominated the tide gauge market, followed by Europe. Asia Pacific is projected to have the fastest growth, owing to a rapidly increasing exploration of new areas for oil & gas reserves, rise in maritime industry, and growing demand coastal zone, port and harbour management and development in developing nations such as China, and India in this region. Among all the applications, hydrographic charting has the highest market share in the tide gauge market. High accuracy automatic tide gauge is the market leader among all types of tide gauge. This report identifies the tide gauge market size for the years 2014-2016, and forecast of the same till the year 2022. It also highlights the market drivers, restraints, growth indicators, challenges, and other key aspects with respect to the tide gauge market. 10.5. Teledyne Odom Hydrographic, Inc.